By making it easier to take care of a diverse landscape, the Rowbot actually allows the landscape to be resettled with a different type of farm. Small machines can get to spots on a field that farmers sitting in the cabs of big vehicles have struggled to tend well — ecological niches like the understory of a bean plant, in between two rows of corn, between layers of grape leaves. When I recently spoke to Paul Hoff, COO of Agribotix, a drone-maker and drone analytics platform based in Boulder, CO, he confirmed that the majority of their customers are smaller farms. Hoff said the plummeting costs of drone components, like the near-infrared and thermal sensors drones use to “see” how plants are doing, as well as easy access to software used to analyse drone data, are the big reasons for wide use among smaller farms, whether in Poland, China or Egypt. Agribotix is used in 35 countries, on at least 42 different crops. In fact, Hoff suggested the benefits are greatest on complicated, diverse farms; not vast monocultures. Where labor is short, a surveying flight by a drone can help optimize when a vineyard decides to harvest its grapes, or a vegetable grower decides to check her eggplant for potato beetles. The downsizing isn’t just about the hardware, but also the business model and outlay for the farmer. Rowbot doesn’t sell its machines but instead leases them. “You heard it here first: RAAS, or Robots as a service,” said This Week in Startups host Jason Caalcanis, modifying the popular (and lucrative) acronym for Software as a Service or SAAS. * HelloTractor. Calling itself the Uber of Farm Machinery, this startup based in Washington, DC and Nairobi, Kenya, allows farmers to request farm machinery, just as you might “hail” a car with Uber. HelloTractor’s delivery system is tied to its own small, smart tractors, which monitor usage and location for the security of the owner. Owners can help offset the cost of their purchase by renting it out. And because labor shortages on farms can lead to poor harvests and lost income, the wider availability of these size-appropriate machines can help whole communities grow. HelloTractor owners can help offset the cost of their purchase by renting it out via an Uber-like interface. * Rent to Own Zambia takes this idea one step further allowing small-scale entrepreneurs in rural Zambia to “rent one water pump, one refrigerator and one hammermill at a time.” The platform isn’t just for farm implements, but the concept remains the same: targetted use of machinery to help humans boost production and income. According to an investor in Rent to Own, the company is just beginning to spread, but there is demand across Africa and a clear need for the same sort of machine “helpers” that my neighbor Marilee was so excited about. I think of the farmers in my community who envy a neighbor’s compost spreader or grain mill or legion of budding apprentices. And the farms that either fail, or never get started, because they don’t work as a one-man, or one-woman, operation. In this context, being able to call on Rowbot or HelloTractor, might make the difference between farm survival and farm extinction. Curator’s comment: by itself, these types of machines will not be enough to undo the centralization of agricultural lands and production, however, by lowering the treshold for mechanisation, as part of a larger mix, they can certainly assist in such a potential trend. Leasing ‘closed’ machines from a commercial firm however, do not create more autonomy for individual farmers. 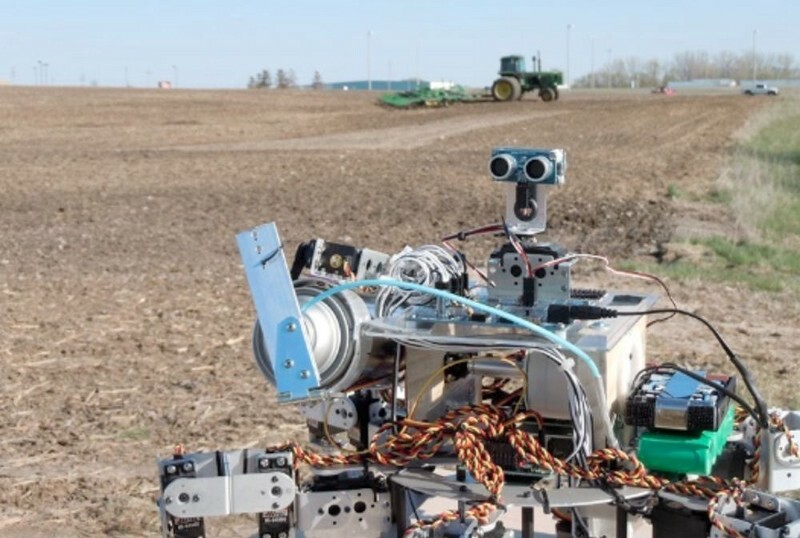 Agri robotics has the potential to enable the cultivation of high value organic crops on marginal land without the need for excessive or perhaps any chemical control. This in and of itself is very exciting. If such devices can be shared between farmers; and their development costs be aggregated by using open sourcing – then even better. We are involved in the development of a low cost 900Mhz telemetry solution for farmers – utilising open systems and interfaces. If there is an appetite to help share the cost of our development (nearly at a beta phase), then feel free to get in touch.